Revealed preference theory, pioneered by American economist Paul Samuelson, is a method for comparing the influence of policies on consumer behavior. These models assume that the preferences of consumers can be revealed by their purchasing habits. It’s very easy to tell a pollster that you want something and another to put a little effort into it. The stated preference is that people want labeling. The revealed preference; judging from the shelves at Whole Foods and Trader Joe’s, two chains whose customers are ostensibly the most passionate about the issue and whose supply chain is in the best position to be responsive to these demands; shows that people apparently don’t really care that much about labels. Enough to say yes to a pollster or sign a petition, but not enough to change their shopping habits. Markets aren’t perfect, but one thing they do really well is match consumer goods to consumer preference. Clearly producers in the natural and health segment of the market don’t see a enough demand to respond to the most motivated anti-GMO consumers or it wouldn’t take Whole Foods until 2018 to shift their product mix over. Both Yale’s Dan Kahan and Grist’s Nathanael Johnson extend this line of thinking to an analysis of the vote. And as soon as the money began to flow, Elway saw a shift in his polling numbers: The measure had a huge 45 percent lead in September. Then the ads began to run, and that lead dropped to 4 percent in October. Among the people who had seen the ads, the measure was losing. “When we asked them why they were voting no, people were reciting the talking points from the ads back to us,” Elway said. One poll found that 93 percent of Americans favor labeling GM food. But half of the people questioned in that poll weren’t aware that GMOs were already widespread in processed foods — in other words, they were concerned, but brand new to the debate. In previous Washington polls Elway conducted on food safety, GMOs had come in sixth out of six potential problems with the food supply. So, while it’s clear that there’s widespread anxiety about GMOs, it doesn’t seem to be deep-seated. They help to illustrate that GM foods in US is not a focus for cultural polarization in the public *as of now*. I am comparing “Hierach individualists” & “egalitarian communitarians” b/c those are the cultural groups that tend to disagree when an environmental issue becomes a focus of public controversy (“hierarch communitarians” & “egalitarian individualits” square off on public health risks; they are not divided on GM foods either). The panel on the left shows that cultural polarization on climate change risk grows as individuals (in this case a nationally representative sample of 2000 US adults) become more science literate — a finding consistent with what we have observed in other studies … I guess that is happening a bit w/ GM foods too– interesting! But the effect is quite small, & as one can see science literacy *decreases* concern about GM foods among members of both of these portions of the population (and in the sample as a whole). It’s pretty clear that the general population is neither polarized or energized by the GMO issue. It’s the final chart of Kahan’s that I find the most intriguing. 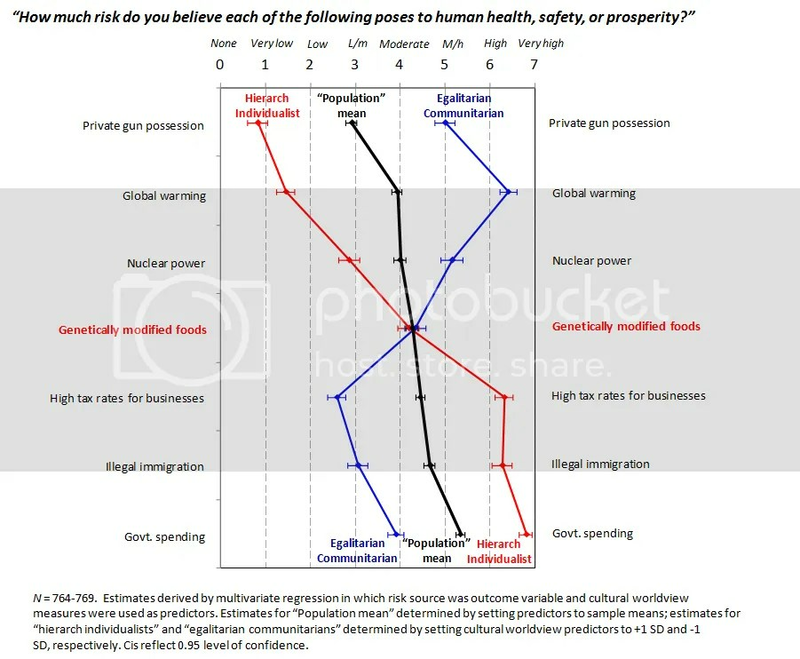 It points to a need for a different axis to gauge cultural polarization than “Hierachical individualists” & “egalitarian communitarians” in order to track GMO polarization, not in the population maybe, but in the debate. What caught my eye is the surprise result that perception of risk DECREASES among both groups as scientific literacy increases. This is the opposite of what you see with most culturally polarized issues. The more numerate and scientifically literate people are, the better they are at convincing themselves that their culturally determined position is supported by the evidence. It’s certainly a reassuring sign and one that I see mirrored in the nearly complete lack of support 37 and 522 got from newspaper editorial boards. a. A rejection or discomfort with the corporate sphere intruding into agriculture. b. A rejection or discomfort with the technological sphere intruding into agriculture. c. A rejection or discomfort with the legal sphere intruding into agriculture. These attitudes represent a fault line mostly within the Egalitarian Communitarian value cluster that Kahan identifies, so polarization isn’t going show up along the HI/EC divide. I’d love to see some work done to tease this out. It would be working in the other direction. Taking the polarization as a given amongst Egalitarian Communitarians and sussing out what the differences in the underlying attitudes on each side of the fault line within that value cluster. The other value among Egalitarian Communitarians that make them more susceptible to the arguments of GMO critics is anti-corporate sentiment. But that runs across the value cluster and wouldn’t seem to provide a distinction between anti-GMO EC’s and non anti-GMO EC’s.